SHIJIAZHUANG - A man lies in a decrepit deck chair with his eyes closed while an old man standing behind him jerks a razorblade up toward his throat. But rather than a gore flick scene, this close-shave situation is merely the traditional way of getting groomed in China - that is, by a barber. Barbering is one of China's oldest professions - one that requires high skill levels from its practitioners. However, except for in some remote villages and counties, this time-honored way of earning a living has been essentially replaced by the beauty salon industry. 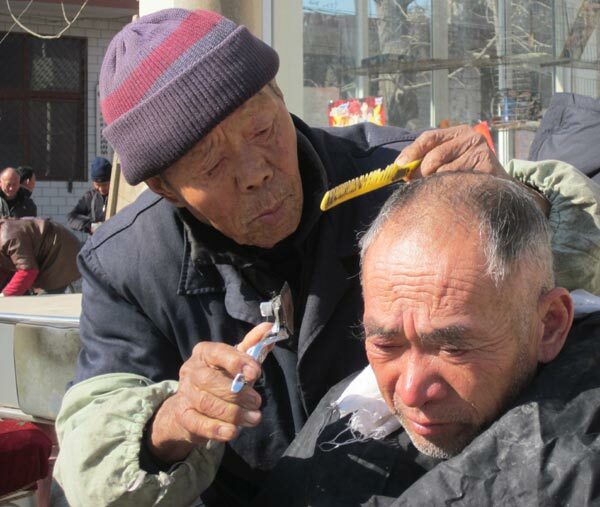 Perhaps the oldest barber in the country is 84-year-old Zhao Zhanbing, who has plied this trade for 72 years in Sijiazhuang, a small township near Shijiazhuang, capital of North China's Hebei province. He spent four years as the apprentice of a master starting from age 12. "My family was very poor and my younger brother had some mental disabilities, which forced me to learn some skills to support the whole family," he said. "I have lived with my tools since 12, and barbering has been my life." Ancient Chinese said barbers would never starve because people always need to shave their heads and beards, Zhao said. The young Zhao used a shoulder pole to carry his tools - shavers, hair-clippers, and a small stove and a washbasin - while walking among the alleyways and villages to seek business. As age has set in, his left leg has become increasingly difficult to walk on, and he requires medicine daily. He started taking an electric tricycle, loaded with his gear, to a county fair market stall. And he shows up fewer days a month. "All of my clients are older guys in their 60s and 70s who come from adjacent villages," Zhao says. "They prefer me not only because I've cut hair for so long but also because we're friends. I remember what they like, such as whether they prefer warmer or colder water rinses after the shaves. But my oldest friends are disappearing as we get older, which is so sad." Zhao usually finishes a session within 40 minutes. A head shave costs 3 yuan (46 cents) and a beard shave is 2. On the best of days, working from 8 am until nightfall, he earns 50 yuan. "The job doesn't bring in much money and can be tiring, but our family built houses on this trade," Zhao said. "I like barbering. It's more than a job to me." Speaking of his declining health, he says, "I don't want to place any more burdens on my grandson." Zhao's oldest son died years ago, and his younger boy was born with mental disabilities. The grandson his deceased son gave Zhao has become the family's sole bread-earner. "I'm afraid I may be the last barber in my county, but I'd like to work until my final day," Zhao said. He then hopped on the electric tricycle his grandson bought him and rode home.